The debate between religion and science is a delicate one at best, and a hostile, divisive one at worst. As such, understanding how and why people are religious, and approaching these questions with intelligent and respectful discourse, is essential. In How We Believe, founder of Skeptic Magazine Michael Shermer attempts a comprehensive exploration of this highly sensitive and important issue. He explains that he addresses “why” to get at the deeper question of “how.” But “why” was already the subject of his previous book, Why People Believe Weird Things. 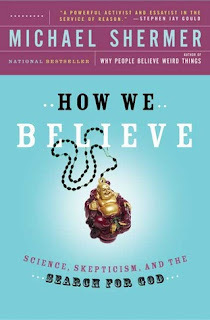 (This book also covers many other types of beliefs, like aliens and Holocaust denial, but belief in God is a major focus). So I was surprised that such a large percentage of How We Believe is devoted to “why.” Especially when it's so clearly billed as a “how” book. According to the back cover: "Drawing on studies in psychiatry, neuroscience, and epidemiology, [Shermer] explores such phenomena as out-of-body experiences, miraculous coincidences, and extrasensory perception." I was drawn to this book based on that description. Of particular interest to me as a neuroscientist are questions about the biological correlates of religious experience. These topics are covered in “Chapter 3: The Belief Engine” and “Afterword: God on the Brain.” Here Shermer explains what we currently know about the "god center(s)" in the brain and how activation of certain brain areas (either by electrical stimulation in laboratory experiments or by seizures or drugs) can give rise to mystical experiences. He also relates this to people's everyday experiences of religion and the mechanisms that reinforce their faith. “Chapter 7: The Storytelling Animal” addresses “how” on a grander scale, discussing the contribution of evolutionary processes to the emergence of religion. This chapter outlines how combinations of traits like pattern-seeking and storytelling make religion almost inevitable and how religion can be an adaptation that has helped societies survive. With the exception of these chapters, I found the rest of the book to be much more “why”-centric. A lot of attention is given to the various reasons why people turn to religion, exploration of the historical relationship between faith and skepticism, and critiques of “scientific” attempts to defend religious beliefs. While important and informative, this is overall not what I was expecting. Lastly, on a stylistic note, this is not exactly an easy read. The content is diverse and dense. And Shermer takes the reader into lengthy passages that I occasionally found difficult to fit into the framework of a given chapter. However, the flip side is that this book is incredibly thorough. In summary, I recommend How We Believe if you're interested in this level of detail and you know what to expect.